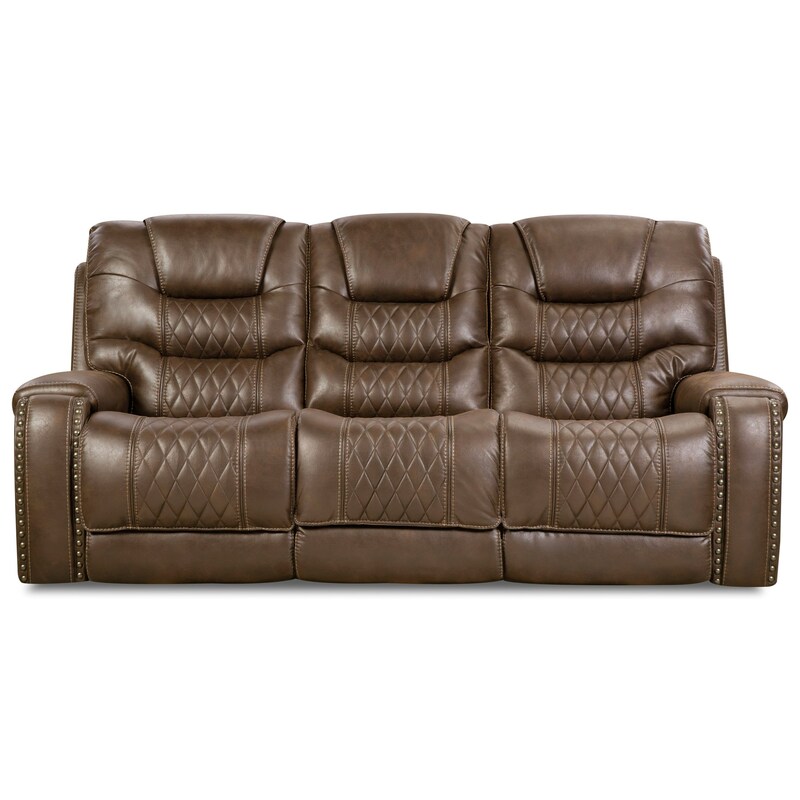 This reclining sofa features a style that you simply can't ignore. Arguably one of the most detailed reclining pieces on the market, this sofa features a transitional style with classic nail head trim cascading down the arms and a quilted motif on the seat, backs and footrests. The 88801 Power Reclining Sofa with Power Headrests and Drop-Down Table by Corinthian at Furniture Fair - North Carolina in the Jacksonville, Greenville, Goldsboro, New Bern, Rocky Mount, Wilmington NC area. Product availability may vary. Contact us for the most current availability on this product. Tailoring Decorative quilt-work style tailoring on seat and back. Padding & Ergonomics Seat has 1.8 density, 28-30 lbs PSI Compression foam. Back is Poly Dacron filled. Showcase traditional detailing and modern function with this comfort-first reclining collection. Quilted detailing and nailhead trim add traditional appeal to the group, while padded arms and smart reclining options let you sink into comfort. The 88801 collection is a great option if you are looking for Transitional furniture in the Jacksonville, Greenville, Goldsboro, New Bern, Rocky Mount, Wilmington NC area. Browse other items in the 88801 collection from Furniture Fair - North Carolina in the Jacksonville, Greenville, Goldsboro, New Bern, Rocky Mount, Wilmington NC area.